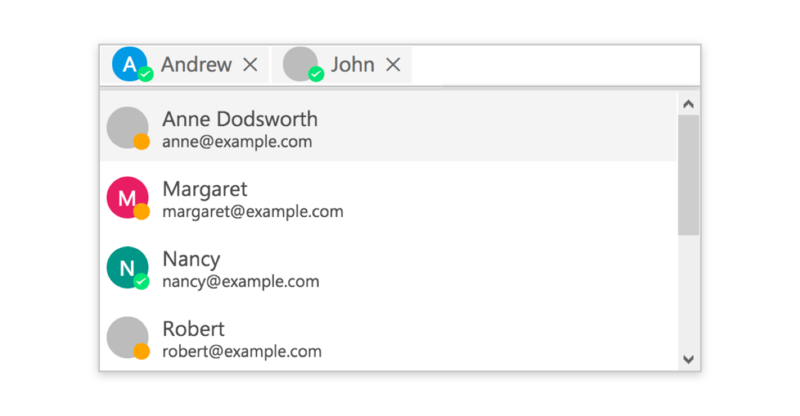 The ASP.NET MVC MultiSelect Dropdown with check boxes allows users to type in or select multiple values from a list. It supports data binding, filtering, etc. The ASP.NET MVC MultiSelect Dropdown is a quick replacement for the HTML select tag for selecting multiple values. HTML MultiSelect Dropdown is text box control that allows the user to type or select multiple values from a list of predefined options. This has several out-of-box features such as data binding, filtering, grouping, check box mode, and tagging with custom values. The ASP.NET MVC MultiSelect Dropdown offers variety of visual modes such as box(chip), delimiter and hybrid mode. It allows you to easily configure visual modes based on application needs. The ASP.NET MVC MultiSelect Dropdown has built-in filtering support with a rich set of filtering configurations available. It allows you to easily change the filter options and use own filter libraries to filter data like Fuzzy search. The ASP.NET MVC MultiSelect Dropdown control has check box support. Enabling a check box on each item helps the user handle multiple selected values. The ASP.NET MVC MultiSelect Dropdown recognizes touch gestures, redesigned UI appearance for mobile devices and recognizes touch gestures.